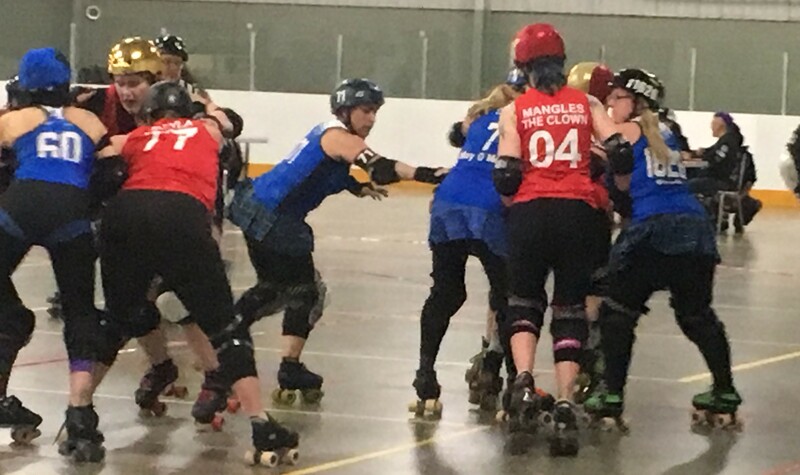 On March 30th, Royal City Roller Derby’s home teams the Killer Queens and Violet Uprising travelled to Neustadt, ON for Winter Wipeout 2019, a tournament hosted by Wellington Roller Derby. 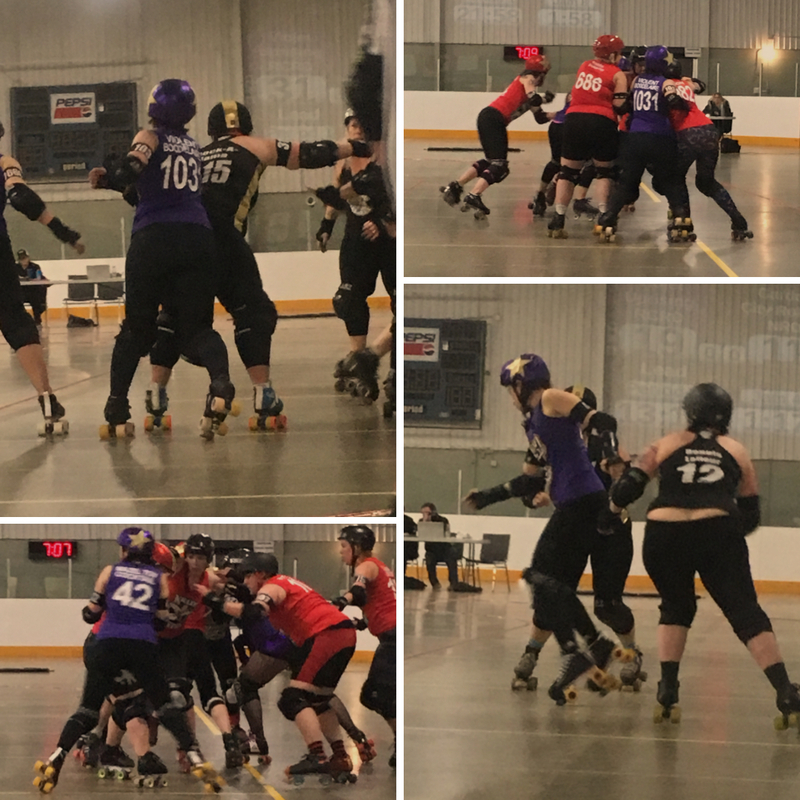 The Killer Queens proved that their stingers were truly lethal, besting the swords of of Violet Uprising and taking home the final victory of the day with a score of 78-57. 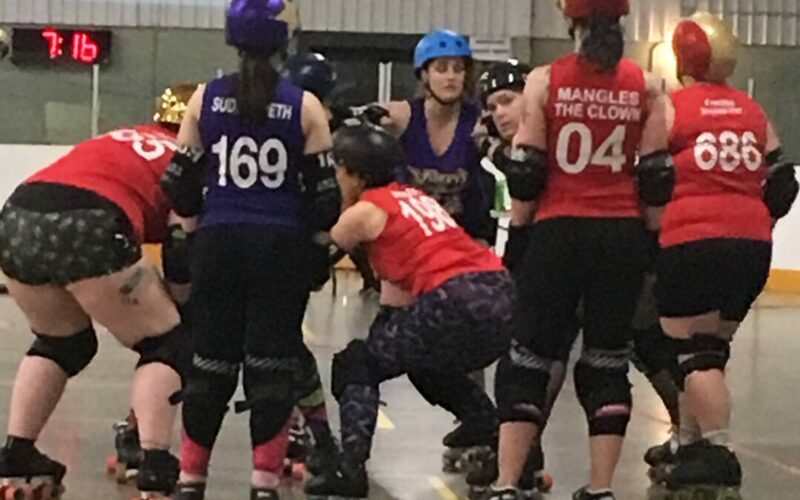 Fielding a rotation of Dr. Jones, Flying Frenchie, Mangles the Clown, Mother Cutter, Olivia’s Wild and Pablo Kickasso as jammers, they bombarded the opposing teams with hits, strategy, and teamwork. A one time jam appearance by Rottwheeler was an exceptional play as they pushed hard against the blockers showing determination and a remarkable drive. After five 20 minute games, the Killer Queens reigned as victors of the tournament and were all abuzz as they accepted the trophy for the second time in three years. These two had their work cut out for them. At one point, Mazel Tov Cocktail jammed for an entire two minutes, pushing three sturdy blockers who had their brakes on for almost an entire rotation of the track. If this is determination is an indication of what’s to come, Violet Uprising is surely on the up and up. Join the Killer Queens and Violet Uprising on April 13th for the family feud on home soil. Will Violet Uprising redeem themselves or will the Killer Queens maintain their momentum? See you track side to find out.